Becky Macey walked away with a personal best and with it a 1st prize in the V35 womens category at a scorching Sunday morning in Folkestone. Macey finished in 44m:18s and 61st overall. Other prize winners included Robert Latala for finishing 2nd overall in a time of 34m:24s just 2 seconds behind the eventual winner, Richard Newsome from South Kent Harriers. Mark Attenborough and Sandi Mortimer both won their respective V50 categories in times of 41m:06s (27th overall) and 51m:35s (180th). In a large field of A&D runners other results include Tomasz Latala in 36m:55s (5th), Ryan Edwards 40m:35s (24th), Jonny Wells 42m:06s (35th), Chris Boyce 42m:54s (42nd), Keith Haynes 43m:27s (48th), Robert Barton 44m:13s (59th), Adrian Moody 45m:42s (71st), Elodie Paviot 47m:03s (102nd), Stuart Nunn 48m:16s (122nd), Mark Carlton 48m:30s (128th), Edward Rodger 51m:00s (170th), James Philips 51m:23s (177th), Aaron Homewood 51m:25s (178th), Mark Cleworth 52m:24s (192nd), Mark Boorer 52m:49s (202nd), Filiz Salih 52m:53s (205th),Keith Lynn 56m:15s, Laura Segust 56m:40s (258th), Neil Woodham 56m:58s (263rd), Sue Reader 58m:56s (294th), Sarah Homewood 1hr:01m:27s (335th) and Rachel Jenkins 1hr:05m:08s (396th). 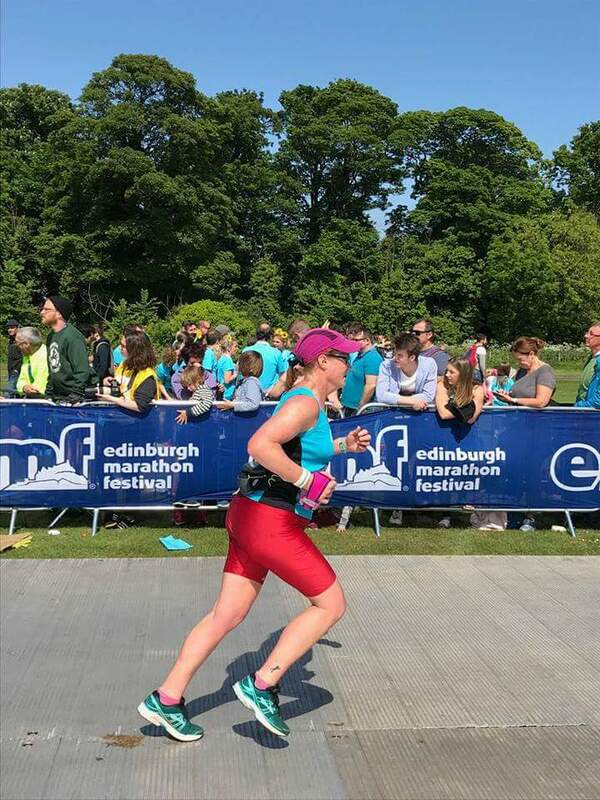 Lucy Johnstone travelled to Edinburgh to compete in her 1st marathon. In glorious early summer weather Johnstone completed her debut marathon in 4hrs:44m:23s. 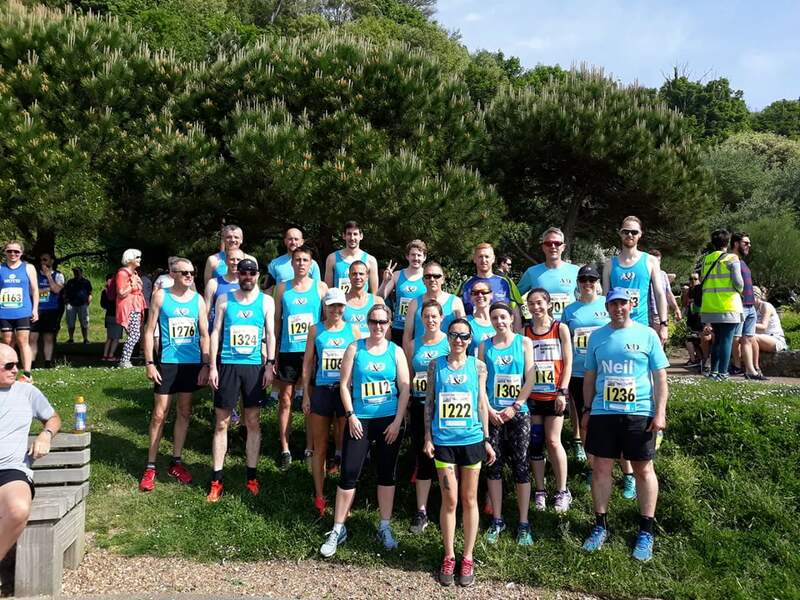 Meanwhile, also in Scotland, Verity Dunbar took part in the Mull of Kintyre Half Marathon and achieved a personal best time of 1hr:59m:19s. At the 1st race of the inter club East Kent Relays last Tuesday, A&D provided 54 out of the 252 competitors and 16 teams overall. There were stand out performances from the Mens A&D senior B team, Vet40 A team, Vet50 A & B teams and the Womens A&D Vet35 B team who all won their respective races. The Mens Senior A League race was a close affair with South Kent Harriers in 1st position and A&D RRC A team finishing 2nd, pipping Folkestone in 3rd by 9 seconds overall. 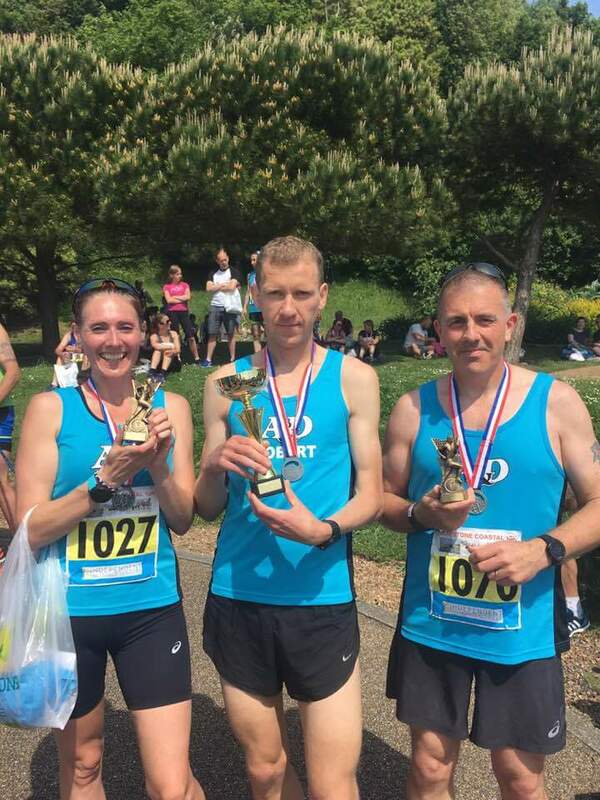 A&D Mens Captain, Scott Lynch, came home first for the club on Saturday at the towns parkrun in a time of 19m:37s (4th overall), followed by Gill Pragnell in 22m:15s (20th), Elodie Paviot and Robert Barton in 22m:29s (23rd & 24th). Mark Attenborough was next up for the club in 23m:02s (27th), James Chapman 23m:17s (34th), Claire Green 23m:55s (39th), Edward Rodger 24m:16s (43rd), Terry Sellen 24m:31s (45th), Will Whittington 25m:13s (54th), Chloe Green 25m:46s (68th), Keith Lynn 26m:11s (72nd), John Fidge 26m:16s (74th), Shaun Snowwolf 26m:46s (81st), Shelly Blake 29m:13s (117th), Ann Fidge 30m:02s (137th), Lesley Moody 30m:40s (141st), Rachel Jenkins 31m:45s (159th), Becky Hodgson 35m:21s (194th) and Julie Foster in 42m:44s (225th). Andrew Noble ran the Kingsbury Water parkrun in 20m:30s (16th), Gill O’Connor and Christine Costiff ran the Riddlesdown parkrun in 22m:47s (30th & 31st) and Trevor Sparkes 24m:38s (36th) ran the Margate parkrun. Finally Trevor Kay set a new personal best at the Serpentine 5k of 17m:12s.